When I saw The Last Jedi on Sunday and General Hux appeared on screen, I pumped my fist without shame. Rian Johnson, in one of the only good moves he made in an otherwise atrocious entry in the Star Wars canon, wisely led off with a criminally underrated character who has overcome his decidedly un-intimidating features to lead the First Order to the brink of victory over the Resistance. Hux is cartoonishly portrayed by Domhnall Gleeson, a pasty ginger who spits out his lines in 100 percent ham mode. Some consider his character ridiculous. They are wrong. I think Hux is fantastic, a committed soldier to his cause with laser-like focus on achieving the First Order's ends. And it is this writer's opinion that Hux should enjoy sole control of First Order military operations—in spite of a few setbacks—since Kylo Ren, aka Ben Solo, aka The One Who Mopes, has endangered Hux's considerable achievements by his susceptibility to rage, fear, and despair. 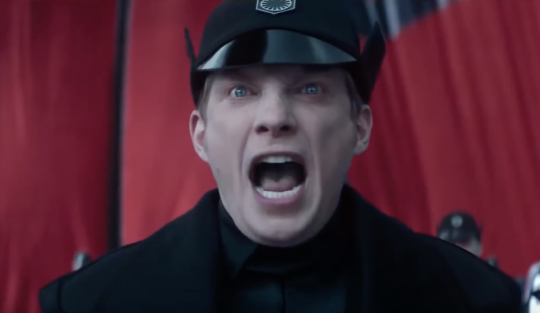 Hux is only susceptible to rage. He's a mad dog that Supreme Leader Snoke somehow tamed. He follows orders. He takes responsibility for mistakes. He gets things done. And look at his accomplishments. It was Hux who ordered the efficient shoot-down of the TIE fighter commandeered by Poe Dameron and wayward stormtrooper FN-2187. It was Hux who admonished Kylo about letting his feelings get the better of him by his insistence on capturing the BB-8 droid to find the map to Luke Skywalker, when Snoke made it clear that destroying the droid was an acceptable alternative. By failing to destroy the droid, the map did indeed get back to the Resistance. It was Hux whose idea it was to use the Starkiller Base weapon and destroy the New Republic to isolate the Resistance from its primary source of funding. It was Hux who gave this terrific—and frankly, inspiring—speech to troops who had previously known only mystic buffoons leading them into oblivion. Here is a true leader, screaming the days of the Republic are over, and promptly making good on his threat! Note the way Hux praises the team for the machine they have built. A lot of man-hours went into that thing. It had to be a proud moment for them to see this amazing super-weapon in action, and Hux remembering their sacrifices. Beneath that spittle and crazy eyes is a big heart. The troops respect that. You think Kylo could have delivered that speech? The troops don't want to listen to someone who slams his lightsaber into a control board when he doesn't get his way and who lets his girlfriend Mary Sue beat him in a mind-reading contest. Now it's true that, in The Last Jedi, Hux does lose a dreadnought and fails to anticipate Ellie Sattler's suicide mission, which splits his starship in half. But he also systematically destroys the Resistance's evacuating transport ships and leaves the rebellion so low on personnel that it literally can fit into the Millennium Falcon. Indeed, the Resistance might have been toast if Kylo hadn't killed Snoke, assumed control of the troops, and immediately fallen for a Skywalker hologram. Do you think Hux would have done that? With his eyes on the prize, the entire Resistance would have been fried to a crisp. So thanks to Kylo's meddling, The Last Jedi ended on a "happy" note, and Hux will have to once again use his superior military intellect to hunt down and destroy the rebels in Star Wars Episode IX: The Porgs Strike Back. There's no doubt that Hux, a "villain" because he blew up a few planets, will meet a fiery end. But it won't be for his lack of effort. This entry was posted in Culture and tagged Satire, Star Wars. Bookmark the permalink.